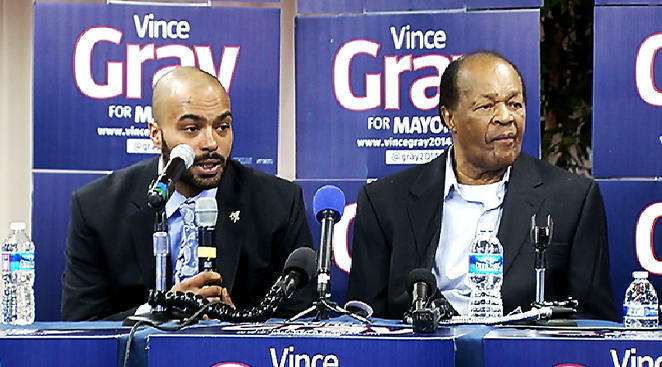 The son of the late Marion Barry turned himself in Wednesday to face charges stemming from an angry outburst at a local bank. Marion Christopher Barry turned himself in at 6 a.m. He was detained for several hours and released Wednesday afternoon. Barry, who is a candidate in the special election to fill his father's unexpired term, faces three misdemeanor charges: assault, destruction of property and making threats to do bodily harm, according to court documents. Barry also apologized for the incident Wednesday, saying he is "committed to rise up and carry the torch" of his father's legacy. "I know that I have a great responsibility as a leader in Ward 8," the apology went on to say. Last week, Barry cursed a PNC bank teller on 7th Street downtown, after she refused to let him withdraw $20,000 from a bank account that was already overdrafted by $2,000. According to court documents, Barry said he would "have somebody waiting for you when you get off work," according to a police report. Barry then threw a trash can over the security glass, destroying a security camera valued at $1,000, documents said. The incident was captured on security cameras.